At the age of 18, William Evert Griffith worked on the Henley Ranch in 1897 with Dan Lovelady who told him about waterwheels. This so impressed him that he insisted his father consider a venture, that proved to be a vision into the future of farming for Klamath County. Six years later, Evert, his father, John and Uncle Stephen bought 270 acres, at $4 an acre, bordering Lost River. Here they built the first waterwheel in Klamath County. The father designed the wheel; Stephen provided the capital and Evert worked with his brother Tis and other workmen to build this unique structure. Garland, Evert's son later wrote, "They constructed the wheel some 33' 4" in diameter, 11' 6" wide with a 3/8" by 2 1/2" iron band around the outer end of the spokes on each outside. They constructed 50 spokes on each side. They made the spokes from 2' X 12" X 16" and the axle from a timber 16" X 16" X 14' 6". At the outer end of each spoke they built a box that held 10.5 gallons of water. As the boxes submerged, they filled, then, the turning wheel lifted the boxes some 27 feet and emptied the water into the flumes. Because of the water they had to use lubricants. They used caked stove-black (mostly graphite) powered and poured onto bacon rinds. 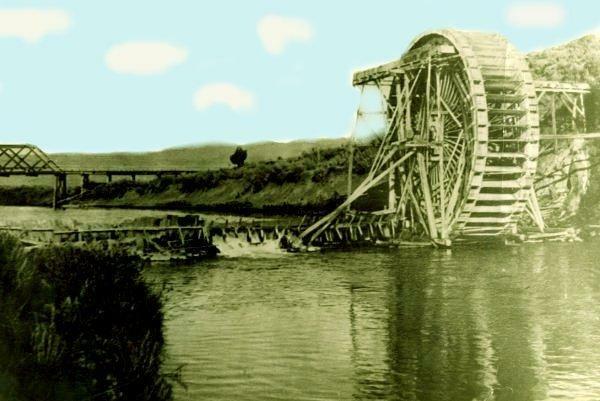 They used the wheel until 1909, when the government purchased their water rights and then tore down the wheel. A photographer took this picture and sold it as a post card.